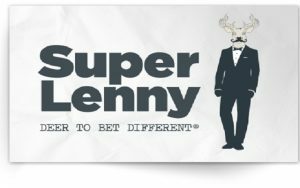 Super Lenny is a new player in the world of online casinos. The casino has entered with a bang and has got people talking. The site is hosted by a deer in a suit and has a sketchy layout and design. It has enticed and attracted users and players worldwide with offerings and features for all types of players. The interface is lively but subtle and the theme is toned down and user friendly. The games are plentiful, exciting and well organized so users can find what they want/need with ease. The casino’s RNG technology also ensures fair play and rewards. Players will have no shortage of fun on Super Lenny as they have slots, live games, casino games and sports games as well as rotating specials. The 461 games are neatly organized into categories to enhance players’ experience. It is quick and easy for users to find something to their taste and to try new games as well. The search feature ensures that players can find their favorite games. Super Lenny not only offers the top rated slots and online casino games, but goes so far above and beyond as to carry out real life tournaments at live tables as well. Signing up for these tournaments is easy with information and instructions readily available to those interested. This live tables section is featured on the site and the online casino offers both its online games and live tables in English, Finnish, Norwegian and Swedish. The site menu is customizable according to users’ wants and needs and allows users to make the site their own. There is constant support available and the online casino is made accessible and welcoming to gamblers that are beginners as well as the most advanced.. The games offered by Super Lenny are powered by Microgaming, NetEnt, Betsoft, Nyx Interactive and Play’n GO. These are the best of the best and offer the most exciting and advanced games for users. The signup bonus for new users to Super Lenny is an 100% first deposit bonus accompanied by 50 free spins. The wagering requirements are below average at 30x deposit + bonus. The bonus doesn’t stop there, as players get a second deposit bonus of 50% as well. The Super Lenny currency is BUX and these loyalty points are earned as players play and wager. One BUX is earned per 0.10 credits spent on pre-determined slots games. BUX can be cashed in for free spins at any of the slots offered on the site. Players will be thrilled to receive 50 free BUX upon their first two deposits. Super Lenny offers missions for additional BUX on an on going basis. Players who choose to accept these missions will be rewarded for their efforts. The mobile site offers users access to SuperLenny’s amazing interface and fun layout wherever they may be. The site has an impressive selection of games and offerings and is compatible with most iOS and/or Android devices. Players can deposit or withdraw using a bank transfer, Mastercard, Maestro, Paysafecard and AstroPay, as well as Visa, Neteller or Skrill. The website is safe and secure and users should not be concerned about the legitimacy of the website. The is a maximum of a £2,000 limit per transaction for withdrawals. The help desk is available for everyone with questions or concerns as Super Lenny understands that issues come up and that sometimes beginners need help. The live chat is open 7 days a week from 11 am to midnight, and they are reachable by phone and email as well.